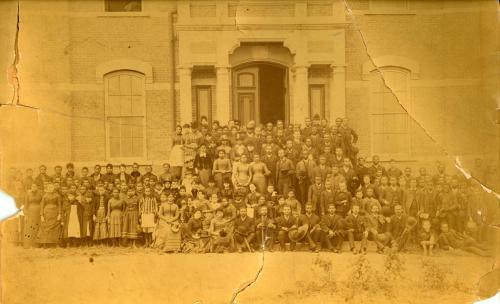 One of the first U.S. institutions to offer a liberal arts education to former slaves in the post-Civil War South, Fisk opened its doors in Nashville, Tennessee, just nine months after the Confederate surrender at Appomattox. General Clinton B. Fisk of the Tennessee Freedmen’s Bureau donated a former Union Army barracks to the school, and students began attending classes at “Fisk School” in January of 1866. Originally supported by the American Missionary Association, the college officially became Fisk University one year later. As part of a fundraising effort for the financially strapped institution, Fisk treasurer and music professor George L. White created a singing group comprised of students at the college. On October 6, 1871, the nine-member choir embarked on a national fundraising tour for Fisk. This group, known as the Fisk Jubilee Singers, introduced audiences outside of the U.S. South to spirituals and Christian songs created by African American slaves. Initially, white audiences expected the students to perform minstrel routines; however, their growing popularity allowed them to vary their musical presentations and send money back to the college by the end of their first year on tour. Fisk commemorates the ensemble’s first U.S. tour on “Jubilee Day,” held on October 6 of each year. In 1873, the Fisk Jubilee Singers toured Europe and performed for Queen Victoria of England. The queen commissioned a portrait of the group as a gift from England to Fisk. Funds raised during that trip also allowed Fisk to construct its first permanent structure, known as Jubilee Hall. The U.S. Department of the Interior designated Jubilee Hall as a National Historic Landmark in 1975. Fisk University has long played an active role in advocating for racial equity in the United States. In 1942, Dr. Charles S. Johnson created the Race Relations Institute at Fisk. The annual, one-week seminar brings scholars from diverse fields together for racial dialogue. Fisk students also contributed to the end of legal segregation in Nashville during the civil rights movement. In the winter and spring months of 1960, demonstrators staged a successful sit-in campaign targeting segregated businesses in downtown Nashville. Using the tenets of nonviolent direct action, student activists, including Diane Nash, Marion Barry, and John Lewis, silently occupied the “white only” sections of local stores, while white onlookers attacked them with rocks, cigarettes, and fists. Local authorities jailed over a dozen demonstrators, but Nashville mayor Ben West released the students and formed a bi-racial committee on integration. Downtown stores began serving African American customers in May of that year. Today approximately 814 students attend Fisk. The university offers sixteen majors and seven pre-professional programs, including an M.B.A. program. Distinguished alumni include scholar and activist W.E.B. DuBois, U.S. Congressman John Lewis, civil rights activist Diane Nash, and former Washington, D.C. mayor Marion Barry.